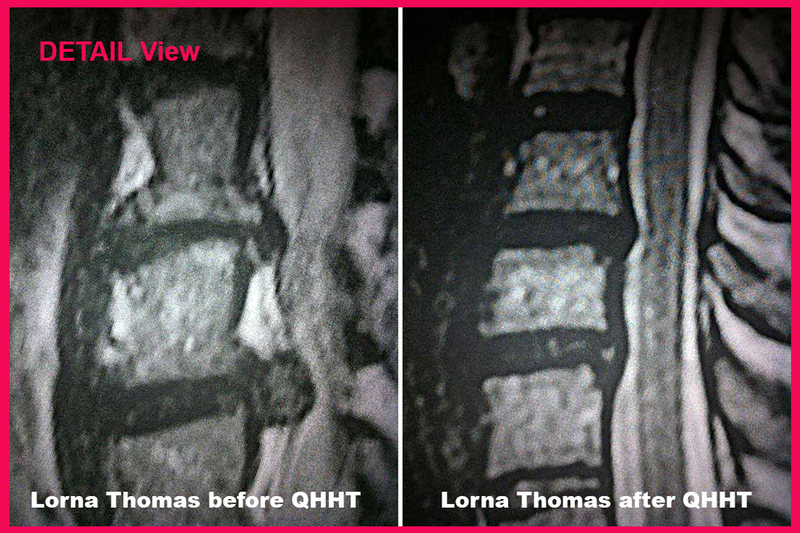 Lorna Thomas, 40, had two incredibly painful bulging discs in her neck that were pressing upon her spine. She could only remain upright for about 4 hours a day. Her neurosurgeon told her surgery was her “only” medical option for relief. After having been given that information, the very next day she had a Quantum Healing session facilitated by Charlotte Daniel. At the conclusion of that (approximately 2 hour) hypnosis session, Lorna Thomas was no longer in pain and was able to move her neck freely. 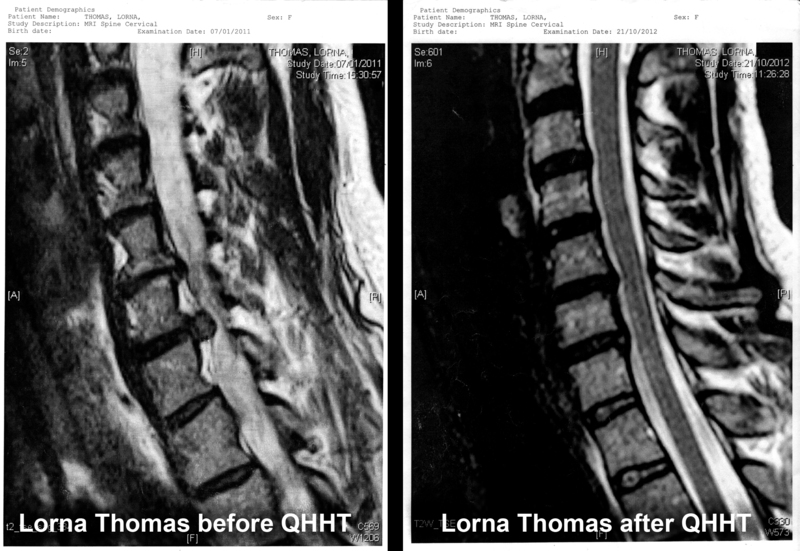 These photographs are images of the before and after scans of her spine. Lorna’s “before” scan was taken January 7, 2011. She had to wait to see the neurosurgeon until the following year due to England’s National Health Service delays, which was actually the same day she and Charlotte arrived to take the Advanced Level Quantum Healing class from Dolores Cannon in Pewsey, England, September 13, 2012. It was the second day of the Level 2 Quantum Healing class. At that time, Dolores had the students form groups of three in which to practice her method. Lorna found herself in a group with Charlotte Daniel and a third person by the name of James Frankland. At the beginning of each practice session the roles were switched with one person being the “hypnotist” one person being the “client” and the last person being an observer. Lorna was thrilled. It was her turn to experience Quantum Healing. She had great faith that it was possible to be completely healed during this session. She was not to be disappointed. 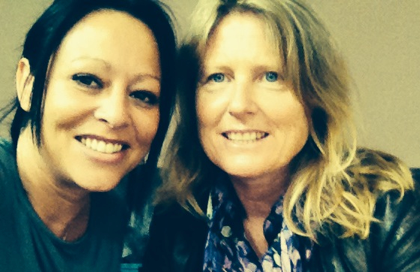 Lorna relates, “I loved learning Quantum Healing at the level 1 class in Faringdon in 2011, so I just had to take the level 2 class too. And knowing that I would get to experience a session at level 2 was really the selling point for me. I told myself that this was going to be the next best thing to getting one with Dolores herself. I wholeheartedly believed that having the session in the class would heal me. As the “hypnotist” in this session Charlotte described what it was like to facilitate, “I don’t think my particular involvement was key to Lorna’s Quantum Healing session being successful. I believe that it was because of Lorna’s conviction that she would be healed and also, of course, the technique of getting her to the level of trance where the healing was easier for her to access and manifest.